Heavy-duty, all-welded steel construction with three locking compartments. Upper compartment has a clear acrylic window and mounting bracket for monitor. Pull-out center compartment secures keyboard and mouse. 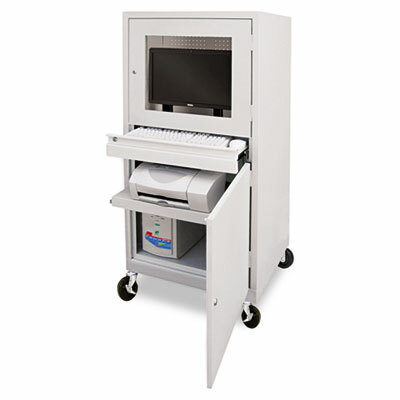 Lower compartment features an adjustable pull-out printer shelf plus bottom storage shelf. Locking full rear door permits easy access to equipment and includes ventilation holes and 2" grommet for cable management. Four swivel casters (two locking) for mobility. Heavy-duty, all-welded steel construction with three locking compartments. Upper compartment has a clear acrylic window and mounting bracket for monitor. Pull-out center compartment secures keyboard and mouse. Lower compartment features an adjustable pull-out printer shelf plus bottom storage shelf. Locking full rear door permits easy access to equipment and includes ventilation holes and 2" grommet for cable management. Four swivel casters (two locking) for mobility.